This is the children interactive story available in English and Urdu languages. 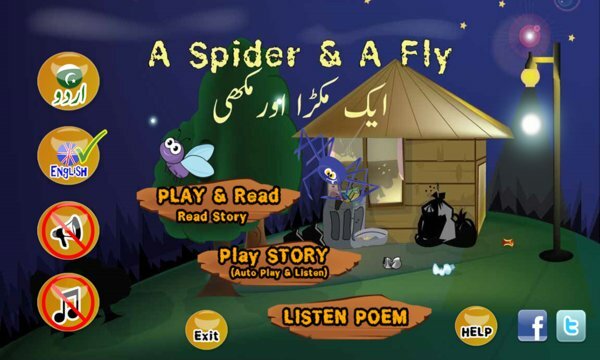 The story is based on a very famous poem of Dr. Allama Iqbal called "Aik Makra aur Makhi "(A fly and a Spider” ) from Bang e Dara -006 which was adapted from "The Spider and the Fly" of Mary Howitt 1829. If ever there were a story for children with a terrible warning, it is this. The app depicts the conversation between a fly and a spider, where spider intention is to catch her with his fake praises. The poem has been converted into an interactive children story to explain it in more detail about the philosophy behind it. This app is available in URDU and English languages, so you can freely download and enjoy with your children. Teach your children what was the core message of Allama Iqbal in this poem. The moral of the story will aware the children about the people who are cunning and can hurt anyone with their lies. Story content, Story audio, and graphic arts are copyrighted by Muqaam.com.